Pregnancy and childbirth is an occasion of joy for the entire family, meant to be treasured and celebrated & what better way to commemorate this event than at BirthRight Premium, A luxury birthing facility that includes a bouquet of luxury suites, including two presidential suites. It is an exclusive offering from BirthRight, the Birthing & Perinatal vertical of Rainbow group of hospitals. It’s an experience to remember when you deliver in the super luxurious suites of this facility. The Premium Birthing Studios is a safe haven where an expecting mother can spend all four stages, the labor, delivery, recovery and post-delivery; of her birthing process in utmost luxury, being provided for in every aspect so that all she needs to do is relax and have a baby. 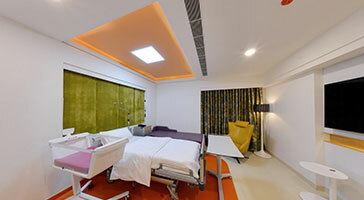 The suites themselves are designed elegantly & include comfortable birthing beds, soft colours and recessed lighting to offer a soothing environment for laboring women. They also have a sitting area and spare bedroom for the attendant, apart from the patient’s room. Birthing rooms have private bathrooms with marble floors and soft bed linens, rocking chairs, and flat-screen TVs, a refrigerator, and a special cot for baby. A special menu caters to moms with dietary restrictions & VIP mommies can also order their meals from an elaborate menu, with butler service. The VIP guests can enter the premium lounge, where they're offered the high tea services. Mom can also treat herself to an in-suite manicure, pedicure, adding a spa-like touch to labor and delivery. BirthRight believes in delivering a child with minimum intervention as childbirth is meant to be natural & propagates family birthing & encourages families to be involved in the events of pregnancy and childbirth in a safe, personalised, comfortable setting. The medical team enables expecting mothers to experience a natural but painless delivery with the help of warm showers, massages, breathing exercises, birthing balls, appropriate positioning and if the need arises, resident anaesthesiologists. The Presidential suites here overlook a beautiful view of the city that adds to the ambience of the area. Muslin cotton swaddling blankets and special cleansers for newborn clothing are just a few of the posh baby items that can be delivered to Mom's suite at any time. An in-suite postpartum massage relieves aches and pains. This star-worthy birthing facility provides 24/7 concierge service to handle a variety of requests. With the Maternal Intensive Care Unit just down the corridor from the suites, BirthRight Premium provides the best of both worlds; enabling a luxurious stay for the mother while also ensuring that she is safe as any medical assistance required is available on the same floor & she can be attended to immediately in case of any complications. We have the best team that is experienced and equipped with state-of-the-art technology to handle complex congenital problems, twin and triplet births. With a neonatologist attending every single delivery, newborn care is at an optimum level at BirthRight. The period leading up to childbirth is most important and BirthRight ensures that the parents are fully prepared for it by providing them with information on pregnancy, labor and delivery, pre-pregnancy counselling, prenatal yoga, breast-feeding support and nutrition counselling. We ensure the child’s safety even after the child has left the hospital by providing classes for new parents on first aid, infant CPR and how to handle emergencies. We offer guided tours that provide details on the pre-admission and admissions process, where to check in and how to reserve a BirthRight Premium Suite.